Thanks to @cambro320 for pointing out this worthwhile Ted talk from Kelly McGonigal on making stress your friend. When dealing with risk and uncertainty, as traders naturally do in markets, stress is inevitable. The question is whether stress generates distress--or whether we can channel stress in more constructive directions. 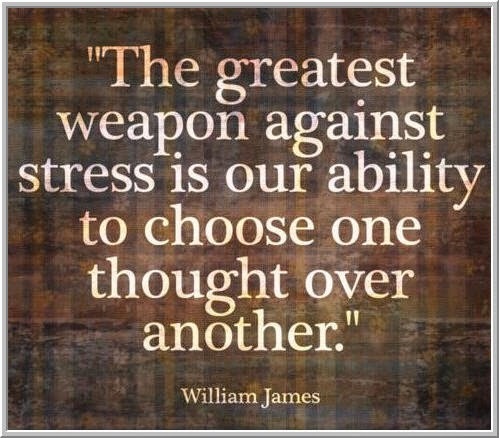 The quote from William James suggests that an important aspect of that channeling is how we think about sources of stress. "One thing we know for certain," McGonigal explains, "is that chasing meaning is better for your health than trying to avoid discomfort." People who experienced stressful life outcomes but who reached out to help others were significantly less likely to suffer health consequences of stress than those who did not reach out. In other words, when stress is buffered with experiences of positive emotion, the stress is less likely to manifest as distress. This brings to mind a several decade old study that examined the physiological arousal of people who experienced test anxiety (performance pressure in academic testing situations) and those who did not. The hypothesis was that test-anxious subjects would experience far greater physiological signs of stress--elevated heart rate, etc.--relative to those who did not report performance pressure. These signs of arousal would then be expected to result in interference with recall of the information being tested. As it turned out, both groups showed high physiological arousal. The group that did not report test anxiety was every bit as keyed up as the group that reported high stress. When the subjects were asked what they were thinking going into the test, the low anxiety group reported thoughts about "being pumped" and excited for the challenge of the test. The high anxiety group reported fears over not performing well. In other words, both groups were stressed, but one group channeled the stress as a performance challenge; the other group as a performance threat. It wasn't the stress of a difficult test that caused distress--everyone felt that. It was how subjects interpreted their stress. Think about two traders in the exact same position based on a sound, well-researched idea with a solid edge. The position moves against them. One is on heightened alert, sees greater opportunity, and has a plan to add at better levels. The other is on heightened alert, sees threat, and pukes the position. Who will make money over time? Perhaps it's not our emotions that do us in as traders. It's what we do with them.